Cancer Commons founder Marty Tenenbaum’s story of his own battle with melanoma is featured in an article published in The Sydney Morning Herald. The piece outlines how studying “super responders” could help improve cancer treatment for all patients. Throughout my treatment, peers have helped me learn about my diagnosis, digest information, and move forward. I was lucky to have a team that knew extending the time of my Perjeta injection could have a positive impact on my quality of life. However, I also know that there are other women who are having a similar experience and may not have this specific piece knowledge within their team. I hope this finds you! I want to share the tidbits I gain from my experience so that all patients have access to the same knowledge, regardless of where you are being treated. On May 21, HackCancer held its 4th Annual White Party in San Francisco. 100% of the net proceeds go to Cancer Commons and will help us get the right treatments to the right patients at the right time. A huge thank you to the organizers and to all who attended! 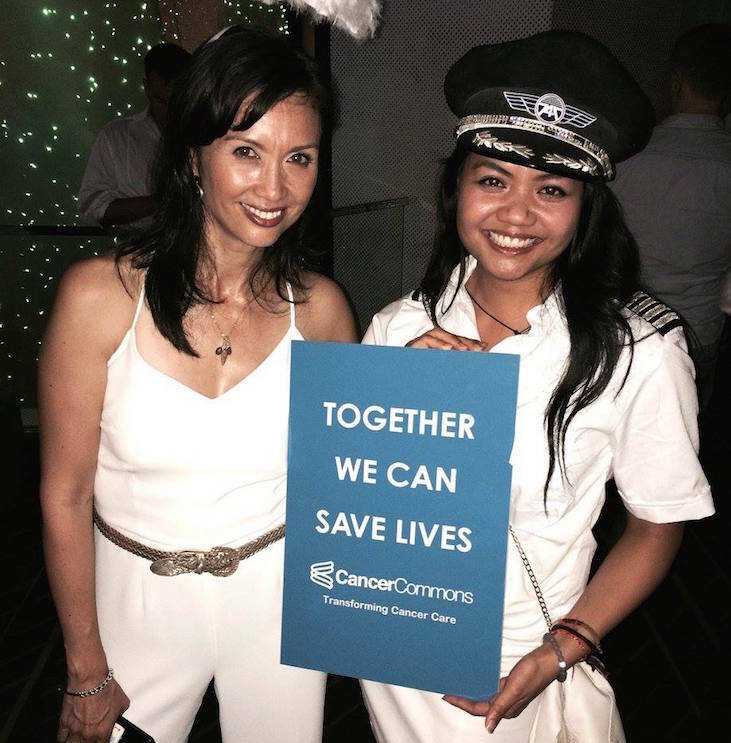 Above: Dominique Kim and Toni Alejandria show their support at the HackCancer White Party. See more photos of the event on our Facebook page. 51 case reports were submitted to our Exceptional Responders in Oncology competition with Cureus. Now, the winning report has been announced: Unresectable Extraskeletal Myxoid Chondrosarcoma of the Neck: Early Tumor Response to Chemoradiotherapy. Congratulations to Mark Zaki, Pam Laszewski, Natasha Robinette, Husain Saleh, Naweed Raza, Ammar Sukari & Harold Kim! Read more about the competition and the winning case report here. We’re happy to announce a successful partnership with Gliimpse, a platform that helps people organize their private healthcare info in a single, secure profile. In a case study, several breast cancer patients shared their Gliimpse profiles with Cancer Commons’ expert network. We were able to respond with insights to help patients navigate their own care. Next step: patients will be able to donate their Gliimpse profile data for research that could help other people like them. Being able to track individual patients in “n=1” studies could accelerate treatment research and allow critical insights to emerge more quickly. Learn more. Check out Gliimpse, and access our expert network for yourself. At last week’s Radiological Society of North America Annual Meeting, radiologists were encouraged to use social media to guide patients to valuable online resources—including Cancer Commons. Social media gives doctors a great opportunity to connect with patients, said Elliot Fishman, MD, at the meeting in Chicago. He urged radiologists to use social media platforms to promote sites like radiologyinfo.org that can help patients learn and be more engaged in their own care. We encourage radiologists to tell their patients about Ask Cancer Commons. This service helps patients connect with experts to answer questions about treatment, diagnosis, clinical trials, and more. A stronger online presence could also allow radiologists to monitor and respond to reviews, improving their relationships with patients. Read more at Medscape. Marty—along with the other awardees—will share his story on March 13, 2016 in Austin, TX. Some cancer patients have outstanding or unexpected responses to treatment. These “exceptional responders” can reveal new treatment approaches and new directions for research. Now, Cancer Commons has partnered with publishing platform Cureus to discover and learn from these remarkable cases. The first Exceptional Responders in Oncology Publishing Competition seeks challenging cases in which patients responded unusually well (or poorly) to treatment. Oncologists are invited to submit entries in the form of case reports. All entries will be made public and will be evaluated according to Cureus’ unique peer-review process. The winning entry will earn a $3,000 monetary prize. We are particularly interested in the treatment options you considered, your clinical/scientific rationale for selecting the treatment, and the patient outcome. Our goal is to share the results with other patients and oncologists who might benefit, so that positive experiences can be quickly explored and negative experiences quickly avoided. Check out the press release, or submit a case. 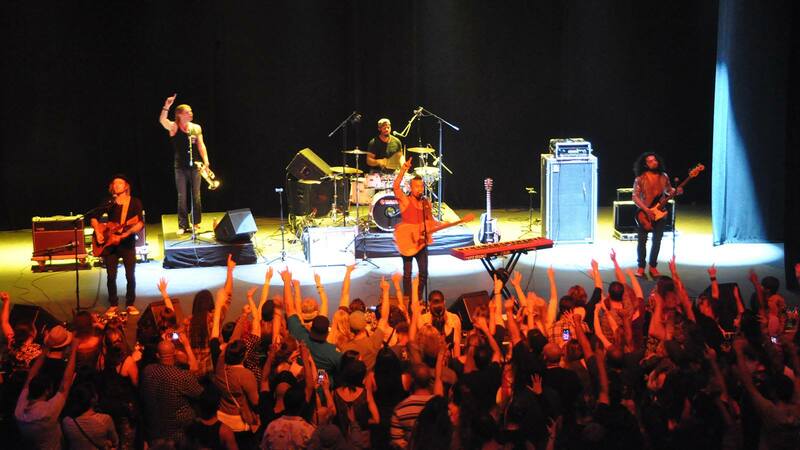 Thanks to all who joined us on Friday at The Shine Project Fall 2015 Celebration Concert to help cancer patients. We were honored to have had talented artists Nahko and Medicine for the People, Butterscotch, Hillary Fitz Music, and the Peter Chung Band perform at the event. A special thanks to our amazing friend Heather Rangel and The Shine Project who made all this possible. For more photos from the evening, check out our Facebook page.